Copenhagen will replace 380 traffic signals with intelligent lights that will prioritize the flow of buses and bicycles over cars at intersections. The signalling is expected to cut travel times for public transport users by 5-20%, while it will be a 10% for cyclists. 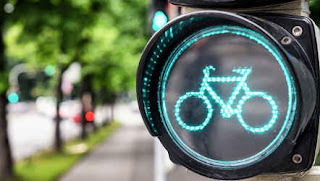 It must be noted that Copenhagen traffic management is set to prioritize cycling by timing bicycle “green waves” at 20 km/h (traffic lights synchronized to allow cyclists finding green lights if they maintain a certain speed). Maybe this helps to keep consistent levels of bike-sharing through the year, regardless of the snowy winter. There are some American cities experimenting with green waves for bikes such as San Francisco (15mph - 25km/h) and Chicago (12mph - 20km/h).